Honest Texas history, when you can find it, tends to comfort the afflicted and afflict the comfortable. So it is with Michael Phillips’ new history of Dallas, which pours salty truth into long-ignored wounds. Almost any “official” history of Dallas, like almost all Texas history, misrepresents or ignores what really happened to hard-working Texans. Dallas, we are told over and over, is “a city with no reason for being” because it lies in an open prairie with no navigable river. The official story is that farseeing businessmen created the city from nothing and guided it through the happy decades to its present prosperous and peaceful bliss. Slavery was never important here. The Civil War and the Reconstruction period were almost unnoticed. The only part of this myth that is true is that the business leaders, in 1870, did indeed bribe the railroad to divert its path through the city, and, in 1935, they raised enough money to get the state fair moved here. Michael Phillips shows that the rest of the Dallas creation myth is hogwash. Phillips, like his University of Texas mentor Neil Foley (“White Scourge”), makes civil rights the axis of Texas history. Texas was, after all, taken from Mexico primarily in order to legalize slavery. Dallas was just as fanatically devoted to racial oppression as any city in the Confederacy. That racism persists to this day. The murders and beatings in Dallas parallel those in Houston or any other part of Texas. The Ku Klux Klan’s national revival in the 1920s had its center and its largest Klavern in Dallas, where mayors, sheriffs and a university president showered it with favors. In the 1950s, the John Birch Society, Sen. Joe McCarthy and other extreme anticommunists were funded from Dallas. Democratic Party leaders Adlai Stevenson, Lyndon Baines Johnson and John Kennedy were physically attacked here. The rabid fundamentalists taking over American churches have a strong base downtown. Native Americans, who were driven out or exterminated in Texas, and Mexican Americans suffered the same in Dallas as they did elsewhere. To a large extent, they still do. Our side of the story, that of resistance and hard-won civil rights victories, is well told in “White Metropolis.” For example, the Dallas NAACP, after a very difficult period of repressive police supervision, became the pride of the state’s civil rights movement. The big legal fights in Austin, El Paso and Mansfield drew their strength from the Dallas organization. Desegregation in education and the right to vote were won from field headquarters in this city. The League of United Latin American Citizens and the GI Forum had strong chapters in Dallas. The progressive movement, which shook the electoral world on behalf of poor farmers in 1894, had its headquarters downtown. The “Deep Ellum” section of Elm Street made an enduring contribution to jazz, soul and folk music. 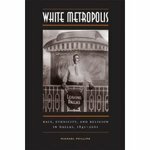 “White Metropolis” is a core necessity for every Dallasite who hopes to go beyond omissions, distortions and lies in their city’s history. It is a fundamental tool for everyone who would make Texas better.